Joyful times arrive in Silver Lake on May 21st and 22nd when the 2nd annual 2-day music and arts street festival, The Silver Lake Jubilee unfurls a festival of music (50 + bands), comedy, literature (readings & book signings), film, “theater, dance and derby,” the visual arts, and neighborhood organizing. If that’s not enough to put you over the moon, Jet Propulsion Laboratory will be showcasing a Mars rover! With full schedules of performances on three different stages, even a fraction of the fun cannot be listed here, so make your plans at the Silver Lake Jubilee web site. Families will enjoy an Eco Children’s Grove at the Silver Lake Jubilee where they will be able to learn about community gardens, listen to readings from children’s literature, and enjoy a variety of active fun and games. Local schools will be involved as well. There will be plenty of things for kids to do. In keeping with the ideals of the Eco Grove, the Silver Lake Jubilee, in partnership with Sustain L.A., will have a consistent environmental tone, which includes a ban on plastic water bottles and Styrofoam. The Silver Lake Jubilee will offer access to free drinking water via water fountains set up throughout the festival, and festival-goers are encouraged to bring their own cups or re-usable water bottles. No bottled water will be sold. Eateries and gourmet food trucks will abound at the Silver Lake Jubilee. Artisans and merchants will offer a variety of beautiful, handmade, and imaginative wares. And in a combined spirit of refreshment and relaxation, there will be also be a beer garden. Like last year, proceeds will benefit the Los Angeles Arts & Athletics Alliance. Sign up as a volunteer and enjoy a few hours of the festival from the other side to support local arts. 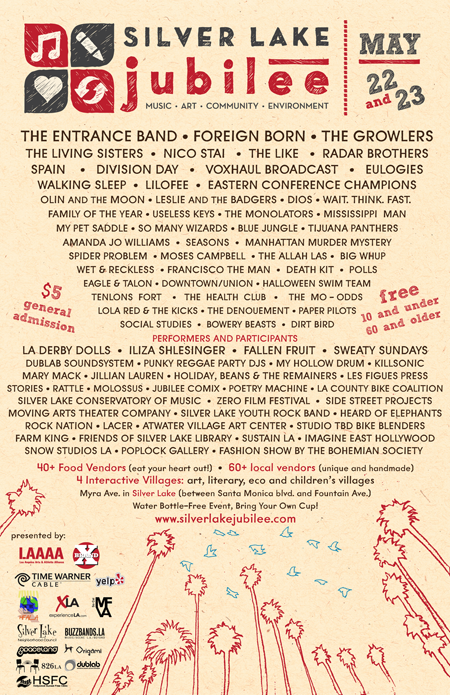 Then plan some time to rest before the Sunset Junction Festival in August. Where | Myra Ave, 90029 (under the bridge at Sunset and Santa Monica Blvd) in the Sunset Junction area of Silver Lake.